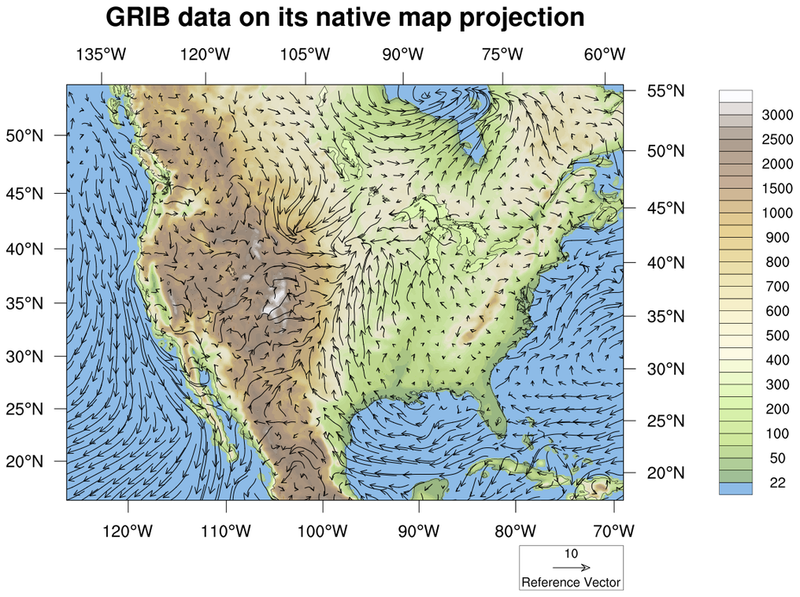 This page is an introduction to using the gsn_csm_xxxx_map functions to plot data (contours, vectors, streamlines) over a map. All of the data files for the examples below can either be found on the data page, or via instructions included in the scripts. To correctly plot data on a map, you must KNOW YOUR DATA. 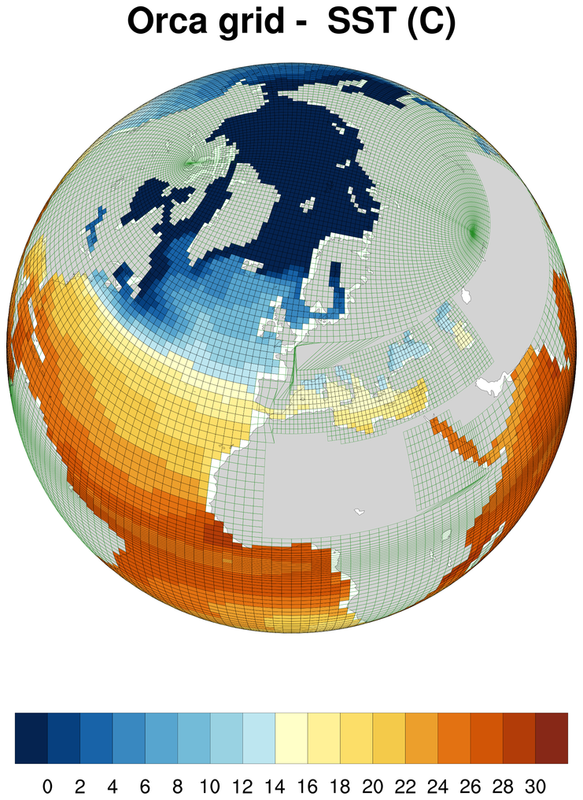 What type of latitude (lat) / longitude (lon) structure is your data on? To determine what kind of lat/lon structure your data is on, use a UNIX command line tool like ncl_filedump on your data file, or use printVarSummary after you read a data variable. The examples below explain how to identify your lat/lon structure. Is your data global or regional? Set the special gsnAddCyclic resource to False. Set additional map resources to zoom in on the map area of interest. Do your lat/lon arrays have units of "degrees_north" and "degrees_east"? If your lat/lon arrays don't have "units" attributes, or they don't have "degrees" type of units, then your data may not plot correctly. See example 7 below for how to fix this. If you have a big grid or mesh that you want to generate contours for, then you may want to do "raster fill" contours instead of "area fill" contours for faster plotting. See examples 8 and 13. Does your data need to be reordered to be plotted correctly? If your data variable is a two-dimensional (2D) array ordered lon x lat, you will need to reorder it to be lat x lon. See example 8 below. 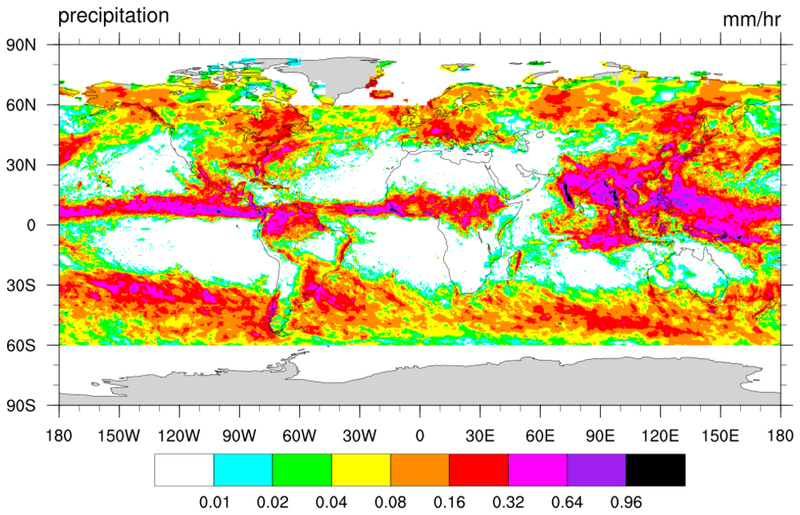 Is your lat/lon data not in degrees? If your lat/lon data is in radians or meters or some units other than "degrees" you will need to convert it to degrees before you can plot your data. See example 13 below. Is your data already projected onto a particular map projection? 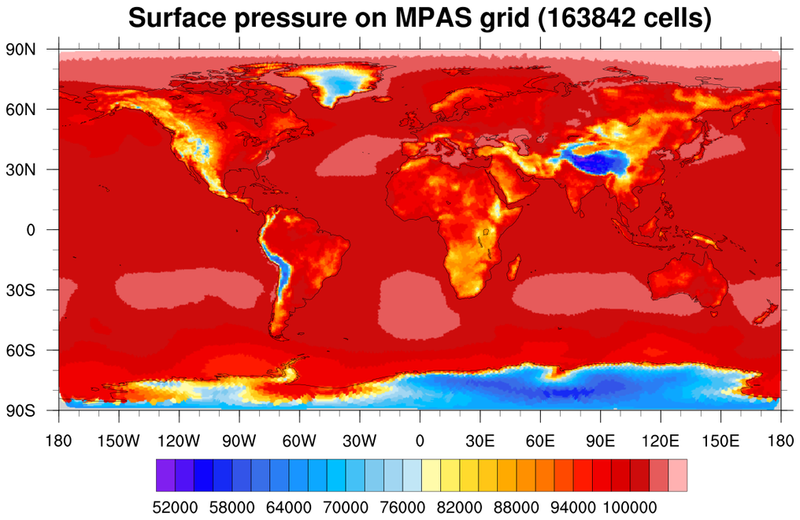 If your data is already projected onto a particular map projection, this is called data on a native grid. 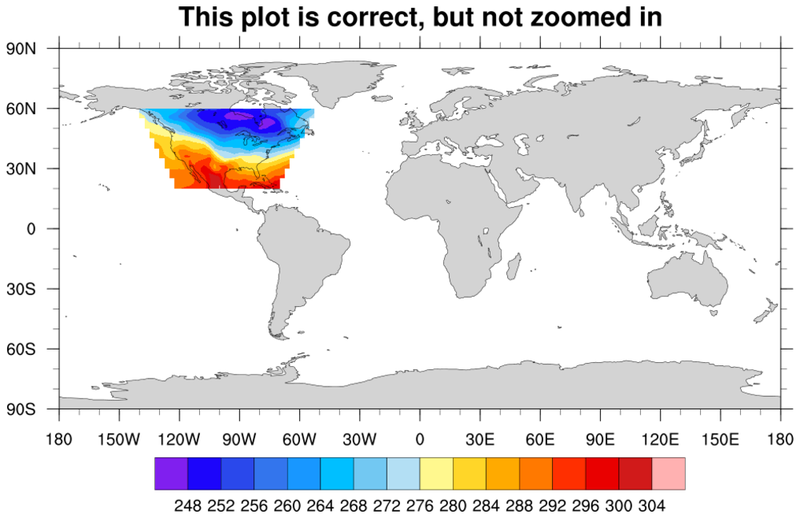 If you know the exact parameters for the map projection, then you can plot the data without needing any lat / lon arrays at all. This can significantly speed up plotting because the data doesn't need to go through a mathematical transformation to be plotted correctly. It is possible to plot data on a native grid in a different map projection, if you have the lat/lon values for each data point. However, if you do this, you do NOT want to set tfDoNDCOverlay to True, because now you are not plotting in a native projection. 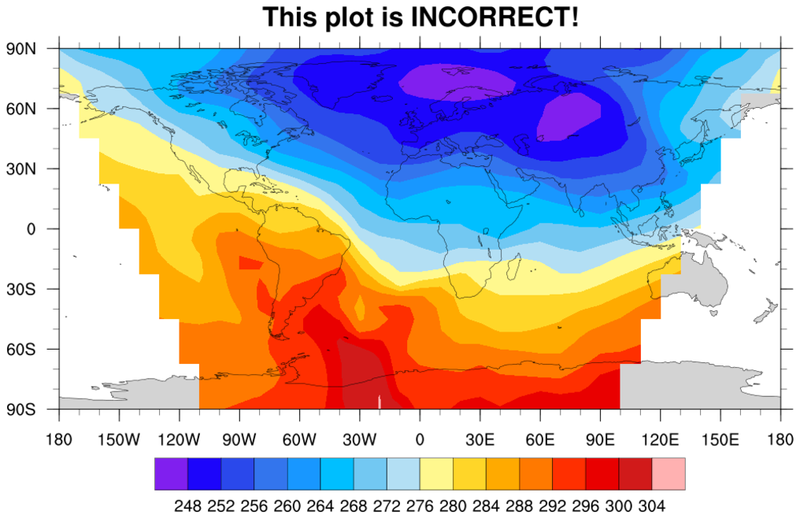 For examples of plotting data both in a native projection and a different projection, see examples 3, 4, and 10 below. Is your data "packed" on the file? Sometimes data is "packed" on a file to save space. This means you will need to unpack it before it will plot correctly. If your data is of type "short" or "byte" when you read it off the file, then this may be a indication that you need to unpack it. See example 9 below. Does the data itself have errors? Having data that needs to be "unpacked"
Use printVarSummary and printMinMax to look at your data, your lat/lon arrays, and your metadata. Pay close attention to any warnings or errors that are produced when running your script. For examples of fixing "bad" data, see examples 7 and 12 below. 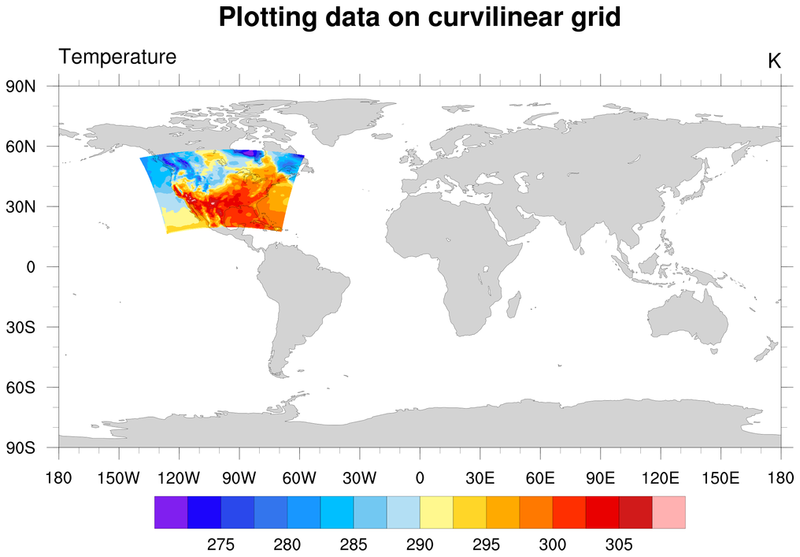 Data on a rectilinear grid is the simplest data to plot because the latitude and longitude coordinate arrays are automatically attached to the data variable when you read it in. Note the "Coordinates:" line, which is followed by two lines indicating the range of the "lat" and "lon" arrays. This means you have data on a rectilinear grid. If your data is on any other type of grid (curvilinear, unstructured mesh, random), then there will be no lat/lon arrays listed after the "Coordinates:" line. 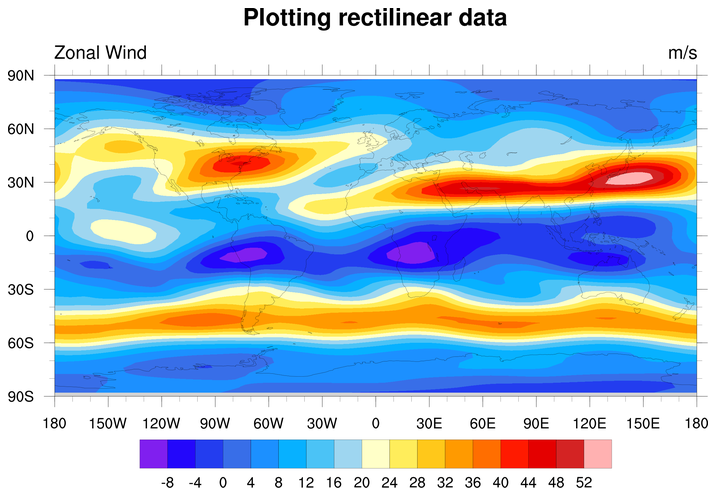 res@tiMainString = "Plotting rectilinear data"
The second frame shows how easy it is to plot the data on a different map projection, simply by setting mpProjection to the desired projection, like "Robinson". The third frame is from the dataonmap_grid_1.ncl script. It demonstrates how to call gsn_coordinates to add the lat/lon lines associated with your data. 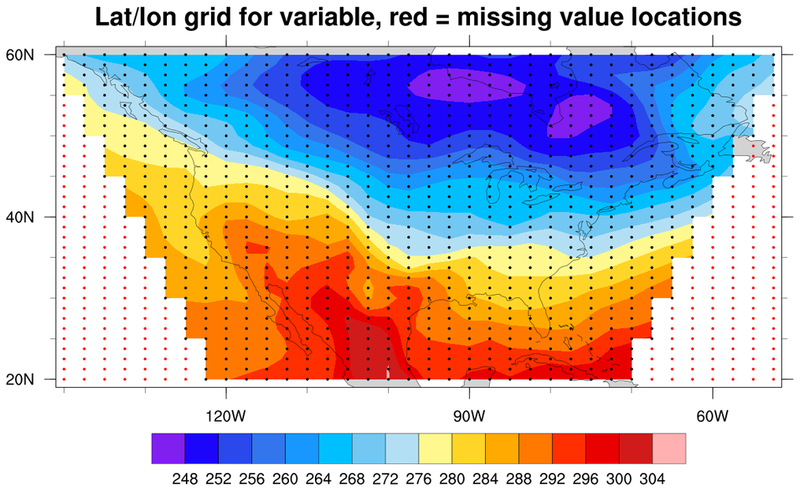 This is the same rectilinear grid as the previous example, except a vector plot is drawn. Both "u" and "v" have coordinate arrays attached to them, so there's nothing special you need to do to correctly plot this over a map. Data on a curvilinear grid is data whose latitude / longitude coordinates are represented by 2-dimensional (2D) latitude / longitude arrays. When you read a data variable represented by 2D lat/lon arrays, these arrays will NOT be attached as coordinate arrays to the data like they are with rectilinear data. This means you don't have any lat/lon data attached to this variable, and hence this data is not rectilinear. If you do have a "coordinates" attribute, then it most likely includes the names of the variables on the file that contain that variable's lat/lon coordinate information, in this case "gridlat_236" and "gridlon_236". Doing a "ncl_filedump" on this file indeed shows these two variables exist on the file, and they are both 2-dimensional and the same size as the lat/lon dimensions of the data variable. This means you have data on a curvilinear grid. In the second frame of this example, we simply zoom in on the area of interest, by setting the mpMinLatF / mpMaxLatF / mpMinLonF / mpMaxLonF resources. The third frame is from the dataonmap_grid_3.ncl script. It demonstrates how to call gsn_coordinates to add the lat/lon lines associated with your data. When plotting data natively, you must set the special tfDoNDCOverlay resource to True (or the equivalent "NDCViewport", in NCL V6.5.0), to tell NCL not to do a map transformation. 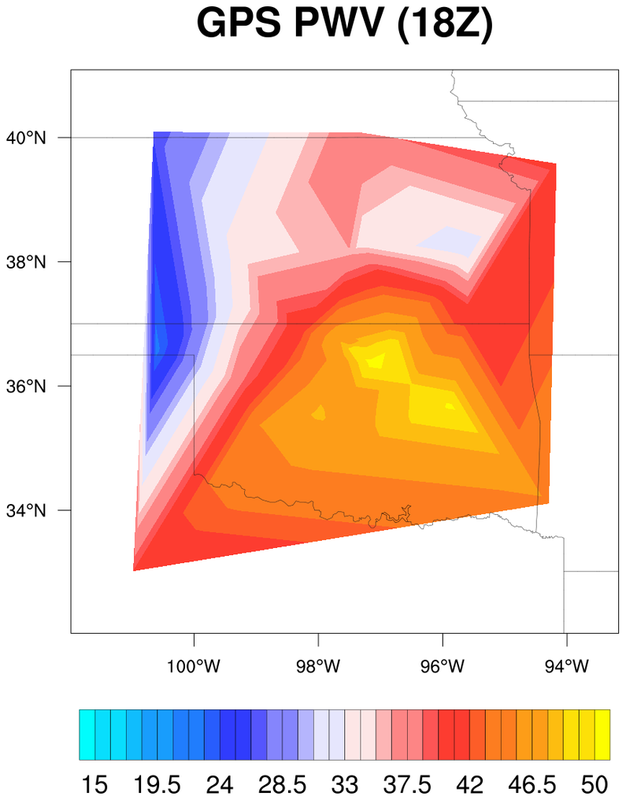 The second frame is from the dataonmap_native_grid_3.ncl script. It demonstrates how to call gsn_coordinates to add the lat/lon lines associated with your data. This GRIB file is similar to the previous one, in that the data variables contain a "coordinates" attribute indicating the name of the lat/lon variables on the file. This time a vector plot is being drawn. The special "lat2d" / "lon2d" arrays must be attached to both the u and v data arrays. 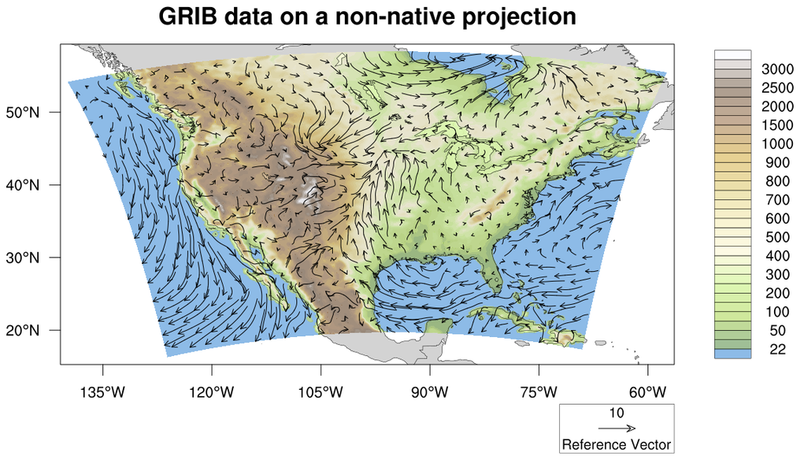 The "native" script plots the same curvilinear vector data as in the previous example, except using the Lambert Conformal native map projection parameters provided on the file. 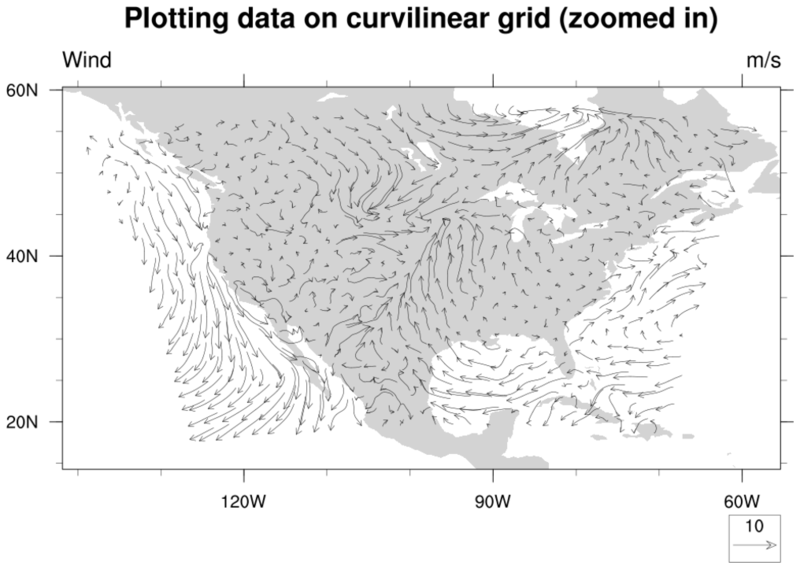 It also overlays the vectors on filled geopotential height contours, which are on the same lat/lon curvilinear grid. 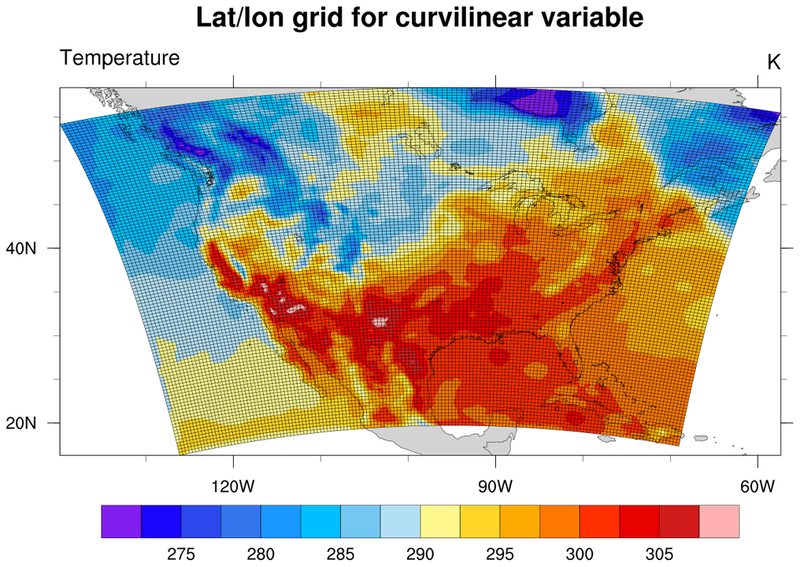 As with example dataonmap_native_3.ncl, the map projection information is obtained from special attributes attached to the lat/lon arrays, and the special resource tfDoNDCOverlay is set to True. 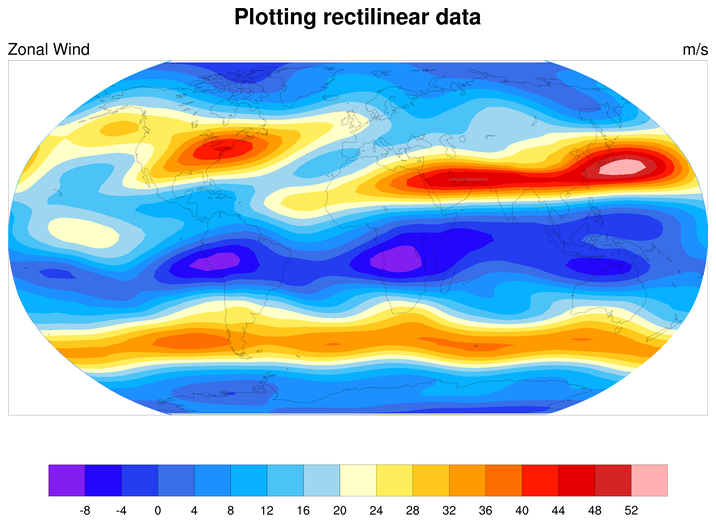 The "nonnative" version of the script plots the exact same data in a basic cylindrical equidistant map projection. If you have a one-dimensional (1D) array of data represented by 1D lat/lon arrays of the same length, then this is considered to either be an "unstructured mesh" or "random points". This example shows how to plot 32 random data points, given a lat/lon value for each point. The data are read off the ASCII file using asciiread. NCL will internally interpolate the data to a triangular mesh before plotting it. You cannot currently plot vectors that are on random points or an unstructured mesh. 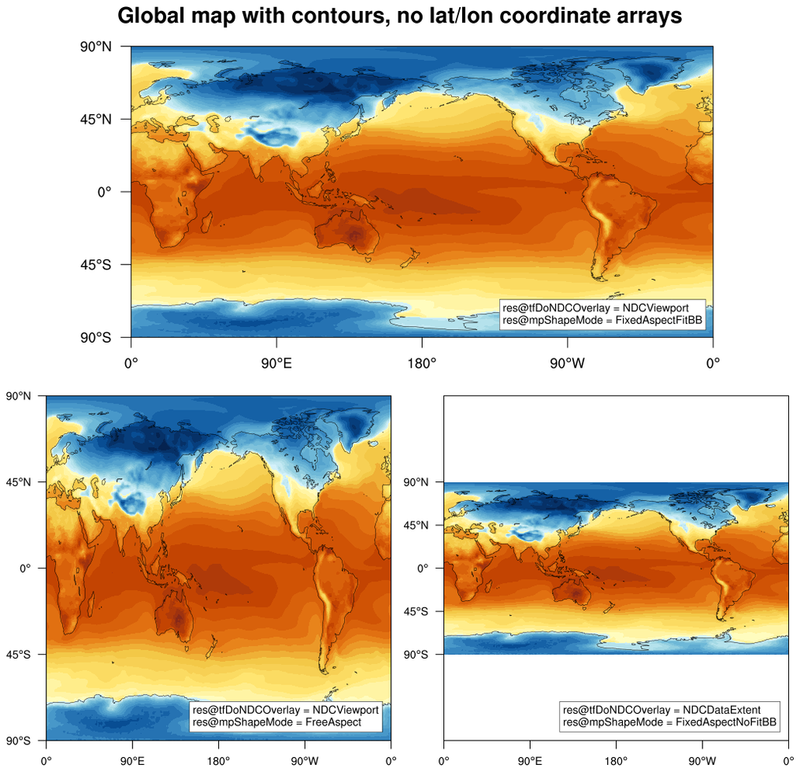 The second frame shows how to plot the 32 random lat/lon locations using gsn_coordinates. Note that the leftmost dimension of the triangular mesh will likely be larger than the length of your 1D data arrays. latitude coordinate array or doesn't contain one at all. This can be fixed by setting the special gsnAddCyclic to resource to False as suggested. The second frame shows the result of the plot once you add the missing "units" and turn off the cyclic point. The third frame simply zooms in on the map area of interest. The last frame is from the dataonmap_grid_7.ncl script. It demonstrates how to call gsn_coordinates to add markers at lat/lon locations associated with your data. The red markers indicate areas where the data contains missing values. In order to plot this data correctly, it must be reordered to be lat x lon. In this script, the reordering is done right inside the plotting call, but you could also do it earlier in the script, like when reading in the variable. This is a rather large grid (3600 x 1800). 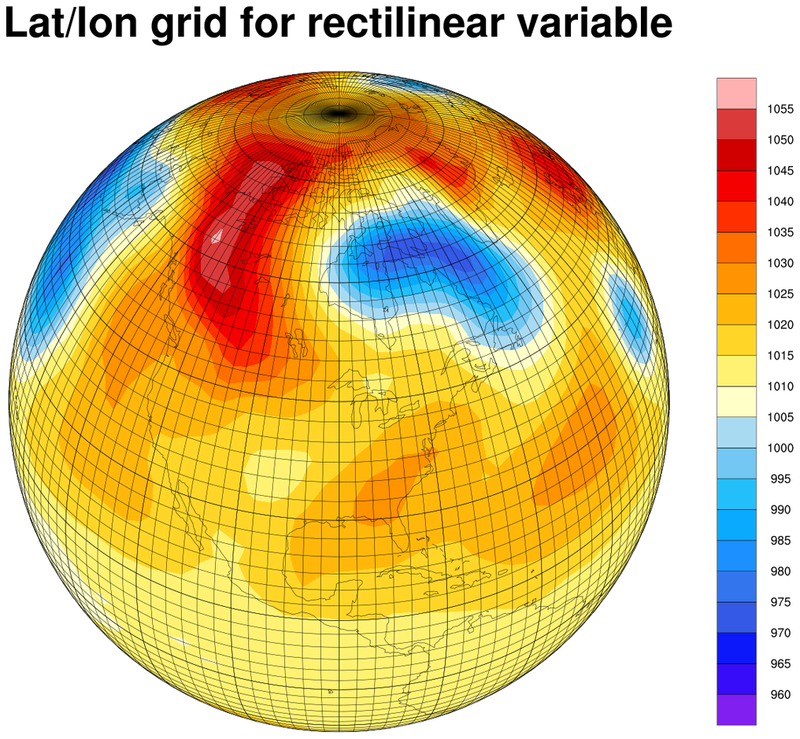 In order to speed up the plotting, we are using "raster" fill for the contours (cnFillMode="RasterFill"). This can make things SIGNIFICANTLY faster for large grids. AreaFill:   Elapsed time = 1070.93 CPU seconds. RasterFill: Elapsed time = 1.01304 CPU seconds. The data for this example is "packed" on the file. That is, it is of type "short" and you must multiply or divide it by a "scale factor" to get the correct values. Sometimes you must also add or subtract an "add offset" value. NCL will not do this automatically! Use functions like short2flt or short2flt_hdf to help you unpack the data. From these min/max values, you can see right away that these are not not valid numbers for pressure. In this script, the short2flt function is used to unpack the data. This function also copies over the metadata. For a "cleaner" plot, we converted the values to "hPa" by mutiplying by 0.01 and updated the "units" attribute to reflect this change. Sometimes the metadata on the file will provide information on how the data should be unpacked, or you may need to find some documentation on your file. Generally, the "scale_factor" attribute is the value that you multiply your data by, and the "add_offset" attribute is the value that you add after you multiple the scale factor. If you have a well-written file, then the metadata may also indicate a "valid range" for your data (see above output). This makes it easier to examine your results and make sure you are unpacking the data correctly. The second frame is from the dataonmap_grid_9.ncl script. It demonstrates how to call gsn_coordinates to add the lat/lon lines associated with your data. 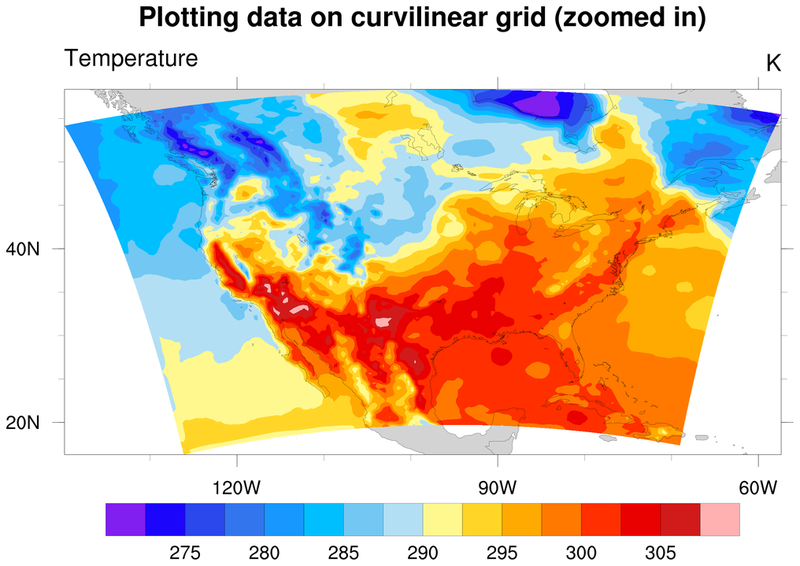 This example plots data on a WRF-ARW grid, which is on a curvilinear grid. The first frame plots the data using the native map projection on the file. The second frame plots the data by reading the XLAT / XLONG arrays off the file and attaching them to "q2" via the special "lat2d" / "lon2d" attributes. 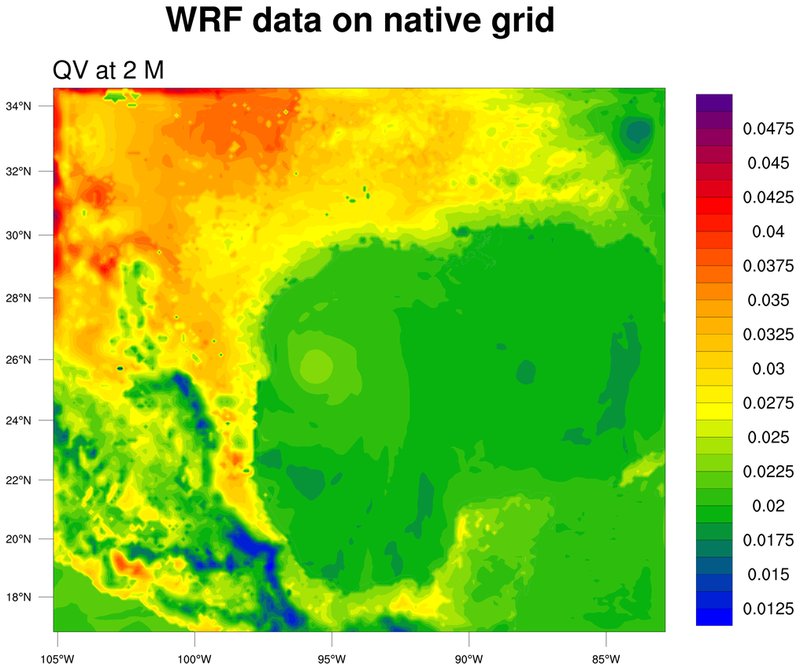 This is an older WRF-ARW file, whose variables do not contain any metadata that describes the lat / lon coordinates. WRF-ARW lat/lon arrays have names like "XLAT", "XLONG", "XLAT_U", "XLONG_U", "XLAT_V", "XLONG_V", etc. If you're not sure which ones to use, look at size of your data variable and pick the corresponding XLAT/XLONG variable that matches the size of your data variable. "XLAT" and "XLONG" are used in this example, but these are the only lat/lon arrays on this particular file. This example plots the same data as the previous example, except now we are zooming in on a lat/lon area of interest. 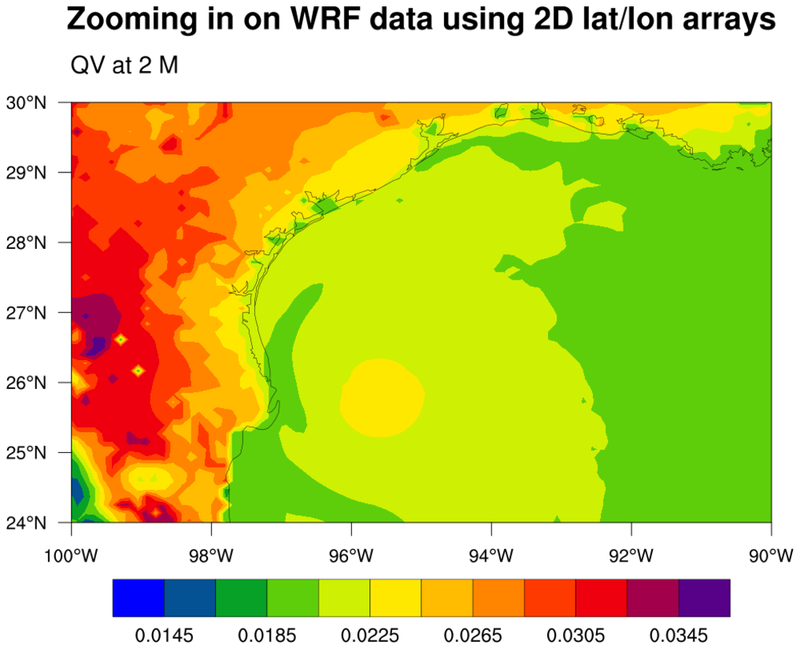 This example shows two ways to zoom in on WRF-ARW data: 1) using the same native WRF map projection, or 2) plotting the data in a different map projection. 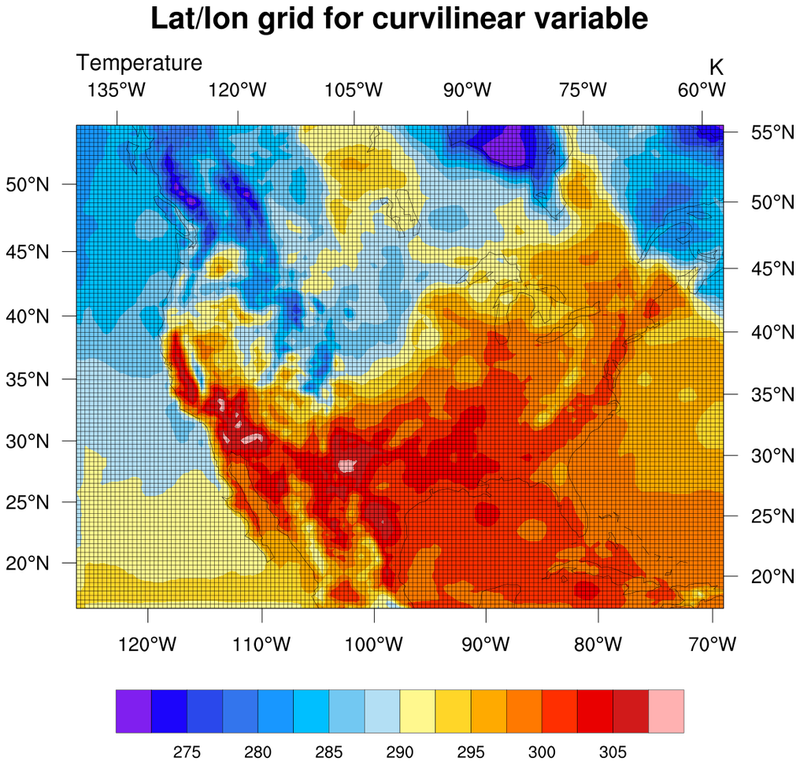 The first plot shows how to plot the data in the native map projection by first using the wrf_user_ll_to_xy function to calculate the x,y index locations into the 'q2' array that represent the approximate lat/lon area of interest. 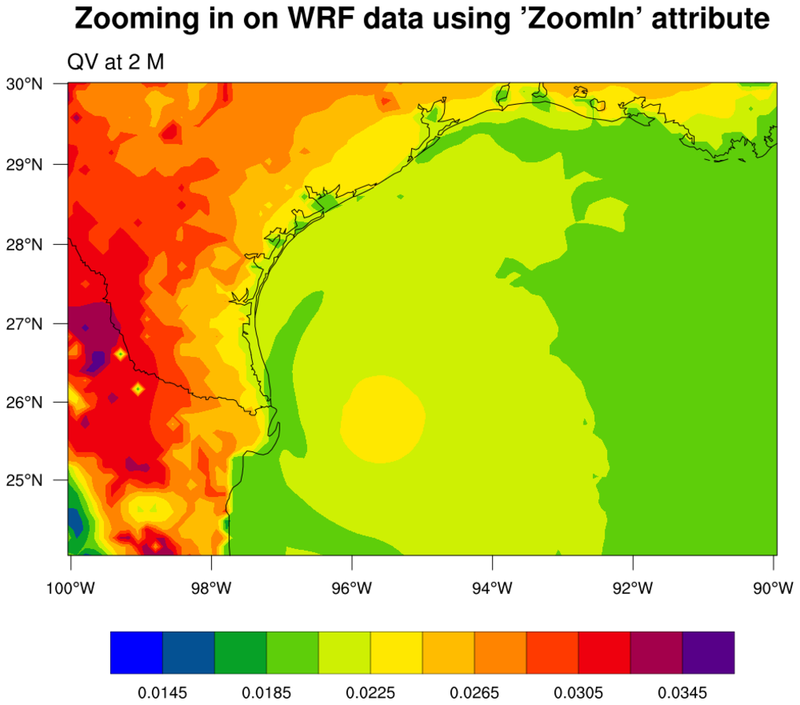 These index values are used with the 'ZoomIn' resource to set the special Xstart, Xend, Ystart, and Yend resources before you call wrf_map_resources to set the correct NEW native map projection parameters. The second plot shows how to plot the data using the 2D lat/lon arrays read off the file. In this case, you don't need the special index values, because NCL will use the lat/lon arrays to figure out the correct subset of the data to plot. You may notice that the two plots are not plotted in the exact same lat/lon area. This is because the lat/lon corners of the first plot are only *approximately* equal to the requested lat/lon area of interest. 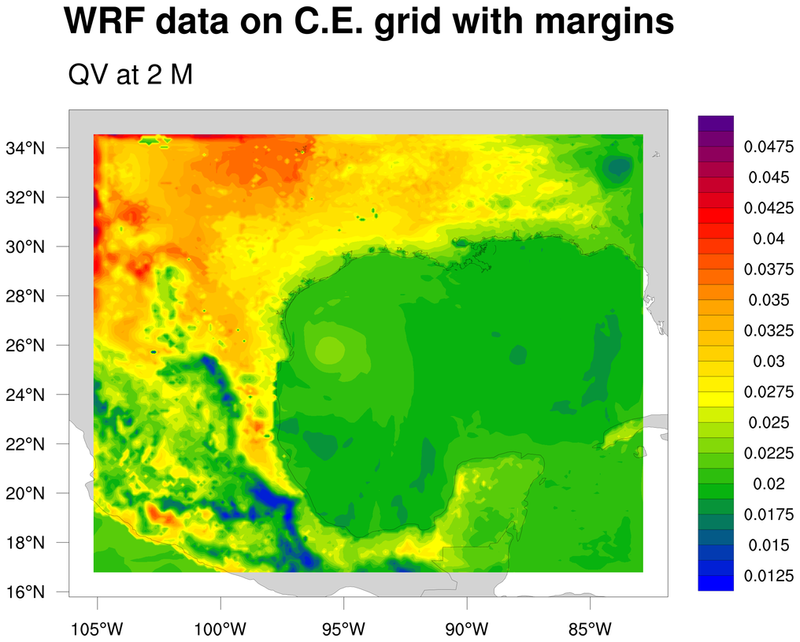 The wrf_user_ll_to_xy function gives you the i,j indexes that are closest to the actual lat/lon area of interest. 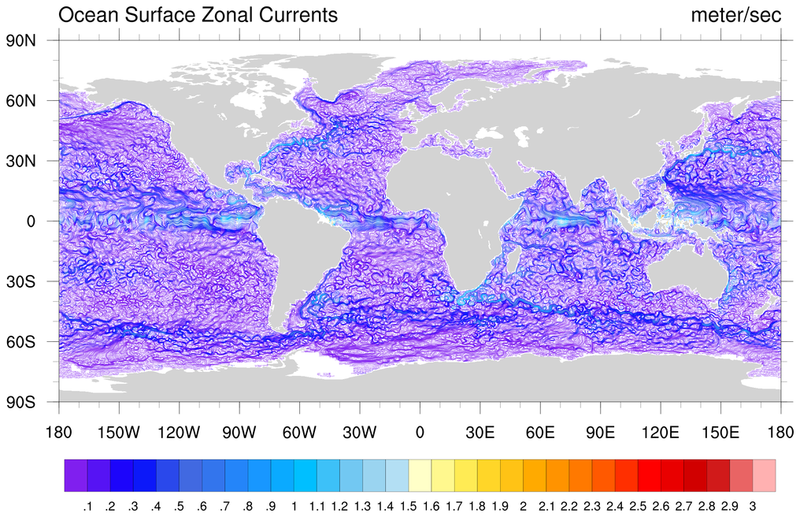 The second plot is the exact area requested, because NCL now has the actual lat/lon arrays, and can use this to interpolate the data as needed, in the area of interest. 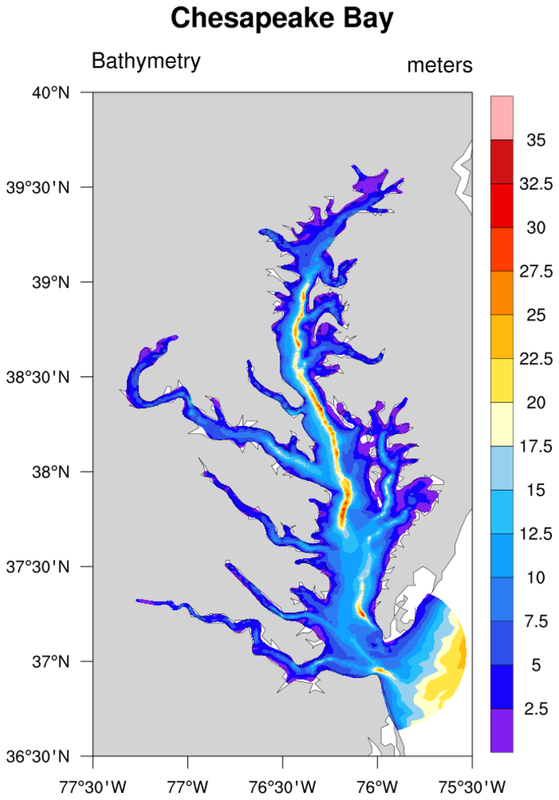 This example plots data on an ORCA (ocean model) grid, which is on a rather quirky, non-uniform curvilinear grid (see the second frame). Based on an educated guess, we looked for "nav_lat" and "nav_lon" on the file, and were able to use these for the "sst" "lat2d" / "lon2d" data attributes. The contours are drawn in "CellFill" mode. The second frame turns on the cell edges so you can actually see the structure of this non-uniform grid. The lat/lon arrays on this file are in "radians" and must be converted to "degrees". Raster contours (cnFillMode="RasterFill") are used here for faster plotting. The purpose of this script is to further illustrate the difference between plotting data that contains lat/lon coordinates, and plotting data in its native map projection (without lat/lon coordinate arrays). In this case, we are plotting rectilinear data, so the native projection is effectively the default projection (cylindrical equidistant). You just have to make sure that when you plot it natively, you give it the correct min/max lat and lon values. In this case, the latitude values for this data go from -90 to 90, and the longitude values go from 0 to 358.75, so all we need to set, really, is the maximum longitude (mpMaxLonF) to 358.75 (because NCL uses -90 to 90 and 0 to 360 by default). The "FixedAspectNoFitBB" is not a commonly used setting, but if you do use it and you are plotting your data natively, then you need to make sure that tfDoNDCOverlay is set to "NDCDataExtent". 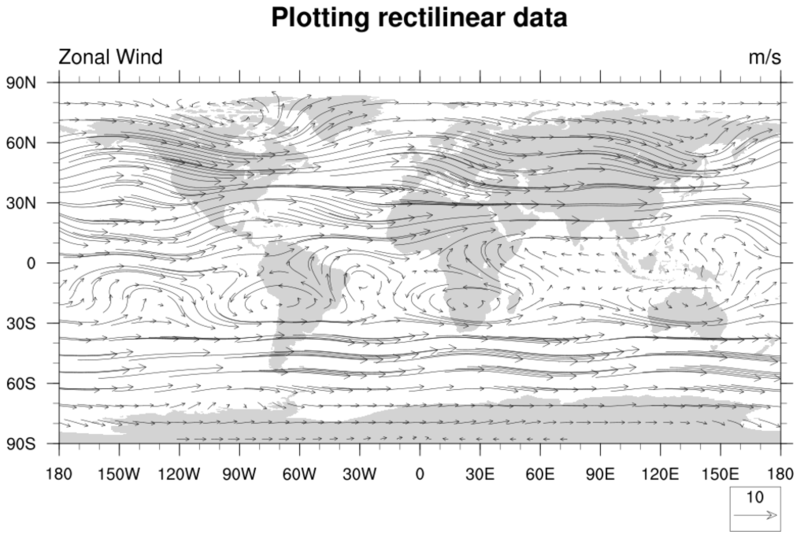 The first two frames are global plots, the first frame being the data with lat/lon coordinate arrays, and the second being data without lat/lon coordinate arrays. The third and fourth frames are regional plots, with the third frame being the data with lat/lon coordinate arrays, and the second being data without lat/lon coordinate arrays. This script will only work with NCL Version 6.5.0 or later, because we had to fix a bug in the gsn_csm scripts that didn't allow tfDoNDCOverlay to be set with a string value.